From the 24-25 of September 2016, the Council for Human and Social Development (COHSOD) will have its annual meeting at PAHO Headquarters in Washington D.C. to discuss a variety of issues including health priorities for the region. The objectives of the meeting will be to: Endorse the new Regional Health Strategy CCH IV; Agree on the revised priorities for the Port of Spain Declaration of NCDs and support for their implementation; Review; and approve a strategy for the involvement of the Community in the Global Health Security Agenda; Review and give policy directives on the priority health system initiatives; and Review and recommend candidates and Member States to serve on sub-Regional, Regional and Global Governance Organs for the Health Sector. 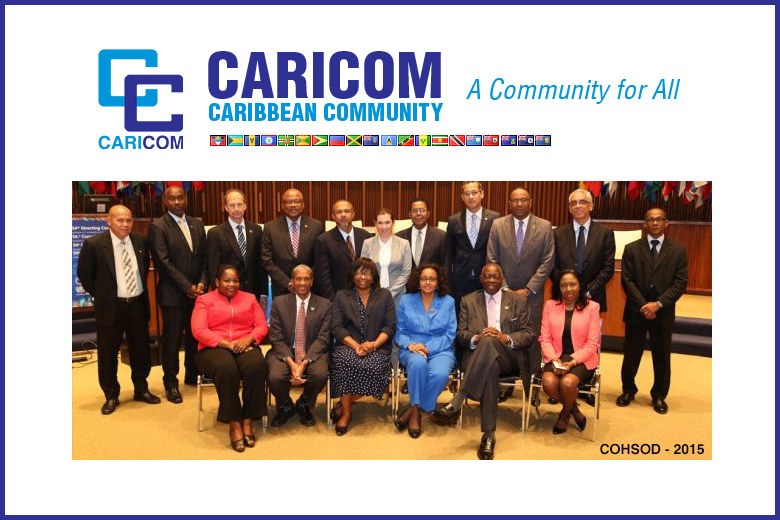 The Non communicable diseases agenda item focuses on: Presentation of the Port-of-Spain Evaluation (POSDEVAL) Report; New Initiatives for Preventing NCDs; and Treatment: A Rational Approach for CARICOM. The HCC will be officially represented at the two day meeting by Sir Trevor Hassell, President of the HCC, who is expected (in this the first COHSOD meeting at which the HCC has been invited to send a representative) to provide the regional civil society perspective on NCD matters due to be discussed. HCC is a member of the POSDEVAL team and fully supports POSDEVAL recommendations. Dr. Alafia Samuels, Co PI-POSDEVAL, will be presenting the evaluation results and proposing steps to accelerate action on NCDs with Health Ministers. N CD priorities for the HCC include promotion of policies and programmes which support combating the emerging epidemic of childhood obesity in the region. In support of these efforts the HCC and our membership have identified childhood obesity as a priority area for our next strategic period. The HCC is in the process of developing tools to support civil society advocacy for policies which contribute to non-obesogenic environments. This includes taxation on sugar sweetened beverages (HCC/NCD Alliance Policy Brief: A Closer Look: The Implementation of Taxation on Sugar-Sweetened Beverages by the Government of Barbados. 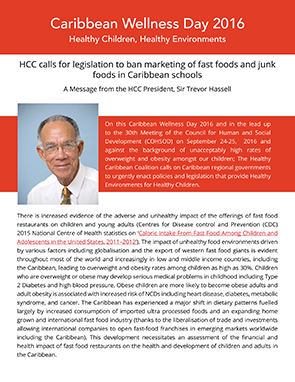 2016) and banning of marketing of unhealthy foods to children including within schools (CWD 2016 Message from HCC President). Key HCC partners include CARPHA, PAHO, national ministries of health/other relevant sectors, and the private sector.